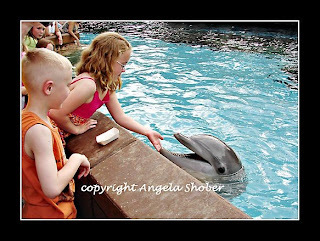 My Fabulous Digi Blog: Bloggin' from Florida! WHOOHOO - here I am, blogging from sunny (and HOT!) Florida! For our first full day, we went to Sea World. This was Maddie's pick, and is a fave of mine as well. It was humid and 96 degrees today, a BIG CHANGE from Minnesota! Our pasty white bodies are now rosy sunburn red! 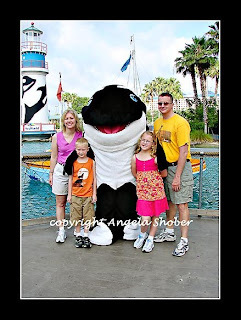 On our way into Sea World, of course we had to pose with Shamu for a photo op! And of course, no trip to Sea World is complete without seeing Shamu! Here he (or is it she?) 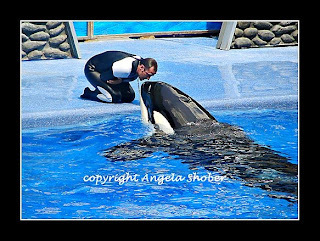 is with one of his trainers during the show...isn't this a sweet picture? I hope to be able to blog all week - we'll see if the wireless internet will hold up! Hope you are all having a FABULOUS WEEKEND! Wonderful pictures Ang !! I'm so happy that you guys are having such a great time!! I'll watch for more pictures! Awesome pics Ang. What great memories the family will have from this trip!